The first episode of Ikoku Meiro no Croisee didn't disappoint me at all. I'm pretty sure this anime is pretty much just shoujo slice-of-life, potentially with story arcs thrown in here and there (and maybe for the ending). Those are hit or miss for me and I really feel like this one will be a hit. The characters are likeable (and visually appealing), I like the realistic way in which they portray 19th century France, and the pacing is far from slow. I'm in. 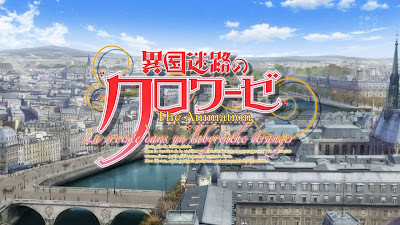 The episode began with a pretty nice scenic view of France. 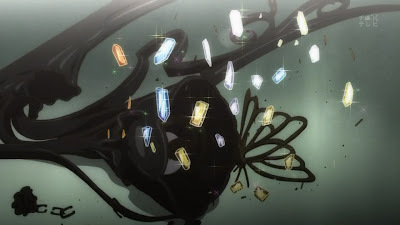 I did like how the animation took so much care to depict realism (or what I perceive to be realism, I guess). It was jarring to see such an environment and then Japanese being spoken, but that's what I get for just not watching French shows. 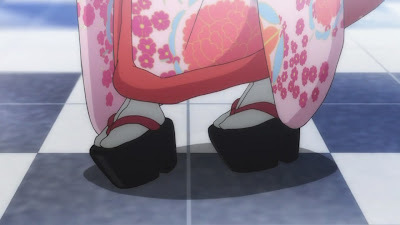 Either way, the main girl (Yune) was introduced right away, running around the street with her insane shoes and being generally cute. I wish I wasn't so easy to please. After the annoying OP (I hate that kind of singing), the episode continued to what will probably be a main location - the shop owned by the grandfather and the main character Claude. At Enseignes du Roy, the grandfather announced that he was just returning from his trip to Japan, where he picked up lots of oddities and interesting things. After initially worrying that Yune was also one of those items (slavery?! ), the grandfather explained the Yune's family tradition was that all women needed to be an attendant at some point and that he brought her over to complete that task. Yeah, I would probably just watch, too. 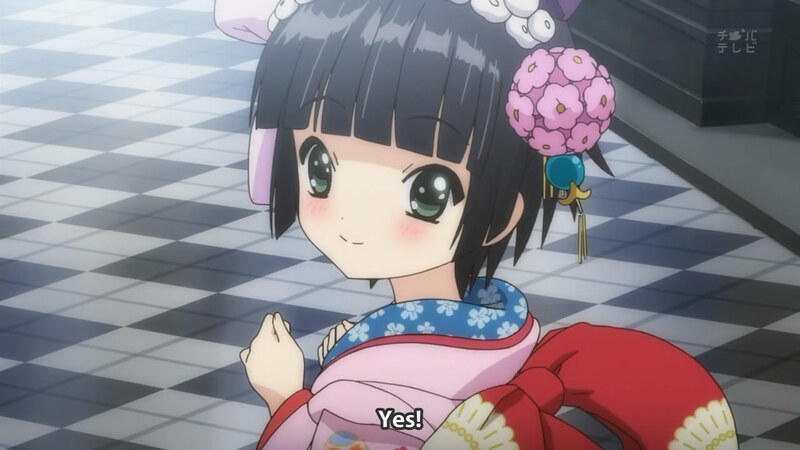 Yune's family seems pretty rich, so I wonder why they sent the girl overseas without sending an attendant with her. Perhaps a plot point later will be the secret people that the family sent to watch over her without really interfering. While there's a chance that Yune's family isn't so rich (yeah, right, given that kimono...), it's pretty weird to have so much faith in letting such a young girl go so far in the days of difficult communication. At any rate, her role is to be a helper at the store. So, glass looks incredibly pretty when it breaks. Such an incredibly typical shoujo boy. There was a lot of quick development, so I didn't dwell on the stereotypical nature of the plot. Claude, to his credit, didn't really emo over it (fixing these things is his job, after all), and he quickly repaired it (including a change to the butterfly wings so it became really unique). Yune, as expected, still felt bad and after being told that apologies couldn't always fix things, offered her most expensive kimono to Claude to make up for her mistake. Obviously being a pretty rare item, it sold instantly. 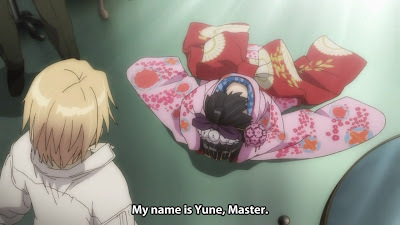 Since this is shoujo along with slice-of-life, of course it turned out that the most expensive kimono was also an heirloom from Yune's (possibly deceased) mother, and Claude confronted her about it. 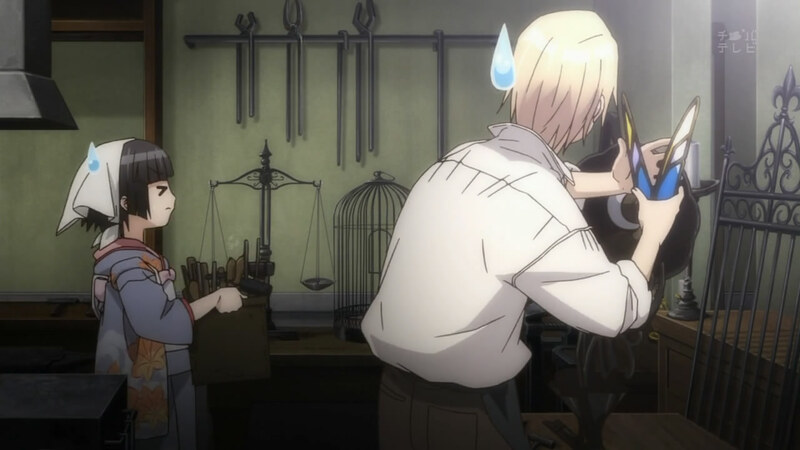 The funny thing was that Yune didn't know French, and so Claude was pretty much just talking to a wall. The funnier thing was that this scene showed that Yune did know French; she had just been pretending to not (potentially under advice from her family, in order to gauge the situation, or something along those lines). 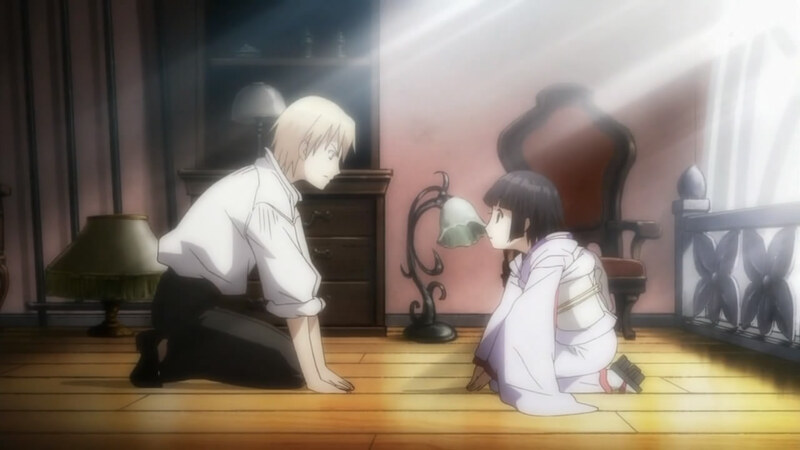 Following right after was the super shoujo development of Claude not only getting on his knees in a manner of apology but also promising that he would get the kimono back no matter how long or how much money it would take (and,in the meantime, would earn Yune's trust). This was a little difficult to not roll my eyes at - but, hey, that's shoujo. I was pulled in at 1:24. 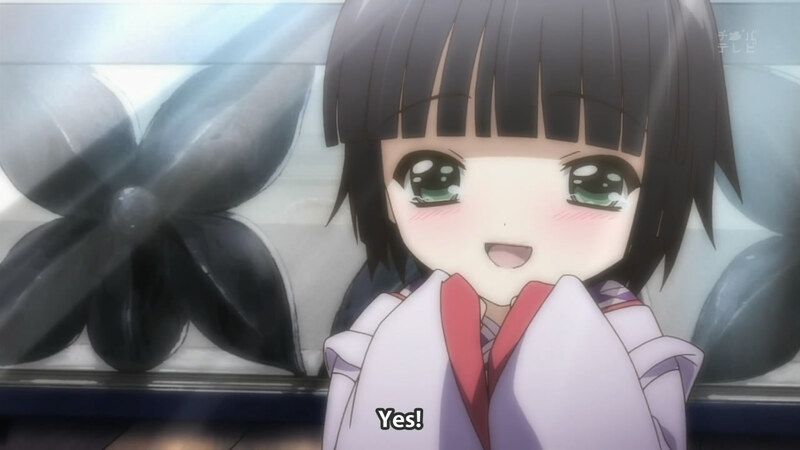 So, by the end of the episode, it turned out that the grandfather's proclamation that Yune only knew greetings and basic French words was a lie, since Yune turned out to know French completely. (She's so a super rich girl.) This made me feel a little bit less confused about how her family could send her overseas; at least she knows the language. I wonder if the grandfather was in on it or not, because I have no way of knowing from their interactions when Claude was not around. 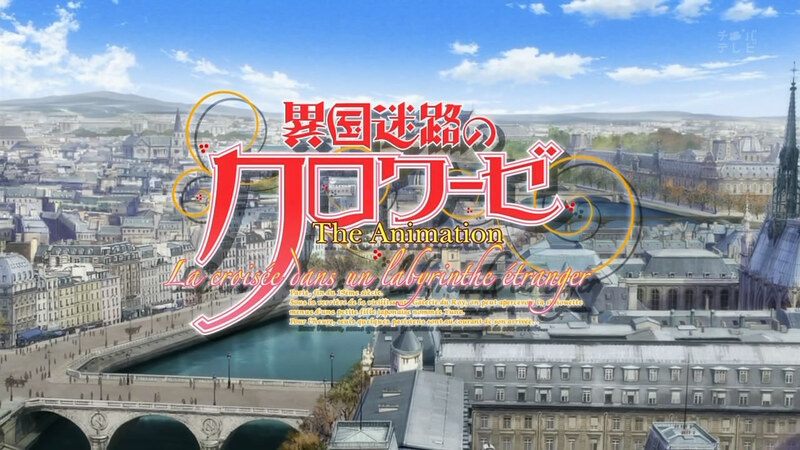 While there was legitimate French spoken when the episode title was introduced, there was no French within the episode itself. So, whether the grandfather knew Japanese, or when Yune was speaking Japanese versus French, are all things that I need said specifically. 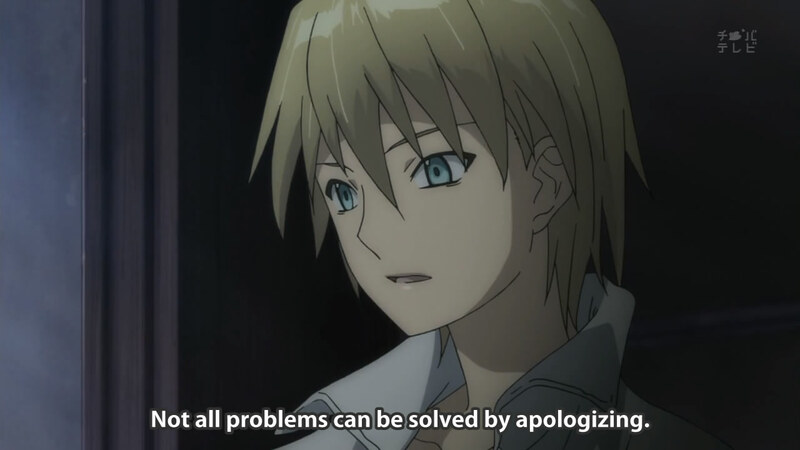 To me, it's always Japanese that's being spoken. If only all attendants were so loved. As it stands right now, there is no way that I won't both watch and blog about this. It seems exactly up my alley. I like Yune and Claude for the most part; the boy really gets a lot of points for not being inexplicably and unnecessarily unwelcoming. Of course, there's a lot of ways in which it could go superbly wrong, but I have pretty high hopes about the enjoyability of this right now.